New student enrollment at law schools is up 2.9 percent from 2017, according to ABA data released last Friday. The number of first-year law matriculants at 122 schools is the same or higher than last year, while only 81 reported decreased class size. Total law school enrollment is up 1.2 percent from 2017, and enrollment in J.D. related programs, such as LLM, masters, or certificate programs, also increased by 8.2 percent year-over-year. The increased enrollment is not surprising given the increase in law school applications during the 2017 application cycle, 8 percent, which was the first significant increase in law school applications since 2010. While some schools have ended up with significantly larger numbers of admitted students, others have become more selective. Within the top 25 schools, according to the U.S. News and World Report 2019 Rankings, 24 saw an increase in applications and all but two reported lower acceptance rates for applicants compared to 2017. On average, the acceptance rate for the top 25 was 21.4 percent in 2018 compared to 24.5 percent in 2017. 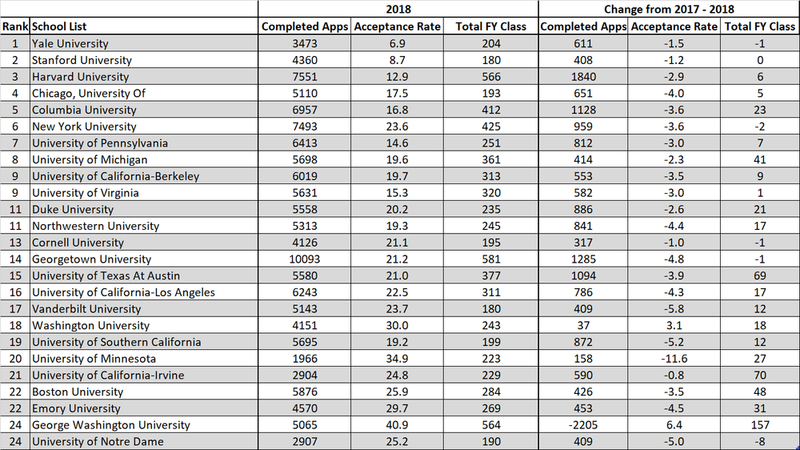 Despite the increased selectivity, most of the top 25 schools did have slightly larger first-year classes than they did the previous year, with increases ranging between 1 and 157 students. A law.com article predicts, based on early indicators, that the application pool will continue to grow for the 2019 matriculating class. LSAT numbers in June and July 2018 were up 30 percent compared to 2017; a similar uptick in LSAT-takers in the summer of 2017 preceded the higher application numbers seen this year. For first-time test takers in July 2018, the New York State Bar pass rate decreased at 12 of 15 New York law schools compared to July 2017. The decreases ranged from a minor 1.6 percentage points at Cornell to 16.2 percentage points at Touro. Nine of the programs’ pass rates fell below the statewide rate of 83 percent, which also decreased by three points from 2017. Graduates from just three New York law schools, NYU, Columbia, and Albany, increased their pass rate. When asked about the pass rates by representatives from the New York Law Journal, law school deans spoke about the programs they are implementing to support students taking the bar, as well as interventions they’ve put in place for students perceived to be at-risk for failure. "I won’t be satisfied with Cornell’s performance until we achieve a 100% pass rate. And we have taken steps to provide academic support to law students we perceive to be at risk for failing the bar." Eduardo M. Peñalver, dean, Cornell Law School. Speak with recent graduates of your law school to find out how prepared they felt taking the bar exam. Ask how they would have changed their preparation method and if they have recommendations to share. When interviewing with firms, find out how they support associates who are taking the bar. Also, take advantage of your summer position to speak with new full-time hires who are preparing for the bar to learn from their experiences. Familiarize yourself with programs your school offers and seek outside programming, if necessary, to ensure you will be prepared. The American Bar Association bar prep page includes resources and discounts for bar prep courses. During the school-selection process, be sure to consider the bar pass rate. Past bar pass rates are available from the Internet Legal Research Group and are included as a small component in the U.S. News and World Report Law School Rankings. When you visit or communicate with program representatives, ask how they currently assist third year students and graduates in preparing for the exam and what new initiatives they may be implementing. Public interest law can provide incredible fulfillment and satisfaction, but the cost of law school is significant and the salaries for public interest lawyers are lower than those going into private practice. U.S News and World Report recently published average entry-level salary data for all ranked law schools. Law graduates in 2016 who entered the private sector averaged just under $85,000, while those from a top 15 ranked institution averaged $180,000. Those entering the public sector, however, collected a much lower average of $53,500. Graduates from the top 15 ranked schools who accepted public sector positions averaged slightly more, at $65,000. Tuition and Scholarship Opportunities: While it is advantageous to attend a top-tier school, you may want to expand your list to include those programs more likely to offer scholarships to students interested in public interest law. That is, if you feel ready to commit to that career path. School Fellowships: Many top-tier law programs grant fellowships, which pay for summer and post-graduate public interest employment, to those interested in pursuing public interest law. Loan Repayment Assistance Programs (LRAP) or Low Income Protection Plans (LIPP): The LRAP is more common and is generally limited to those working in public interest law, while the LIPP works more like scholarship money that is received after graduation. Over 100 law schools have an LRAP in place, and the American Bar Association has compiled a list of programs. When considering a school’s LRAP, consider if an LRAP is funded through a specific endowment or designated fund and how many applicants typically receive LRAP funding. Most schools are not able to provide funding to all applicants. Public Service Loan Forgiveness (PSLF): The PSLF provides debt forgiveness to those who work for a qualifying government, non-profit, or public interest organization, and who make 120 qualifying student loan repayments while working for that organization. There is some uncertainty regarding the future of this program, however. It has been slated for elimination in two of the President’s proposed budgets. Other Federal Repayment Adjustment programs: There are other existing repayment programs based on income, such as the Revised Pay As You Earn (REPAYE), Pay As You Earn (PAYE), and Income-Based Repayment (IBR). These adjust monthly payments based on your income. While public interest law may require some additional planning in terms of selecting and paying for law school, there are many resources available for prospective law students who feel passionate about pursuing this career path. Some additional research during the school selection and application period can go a long way towards making your dream come true. The “Trump Bump” theory is real. Earlier this year, Kaplan Test Prep released the results of a survey of over 500 pre-law students and found that 30 percent of respondents said the 2016 election impacted their decision to apply to law school. “We’ve seen significant jumps in both LSAT takers and law school applications over the past admissions cycle, which has fueled speculation about how much impact, if any, the 2016 election and subsequent political climate has had on this year’s law school admissions landscape. We now have an answer: It’s significant,” said Jeff Thomas, executive director of pre-law programs at Kaplan. Survey data released by BARBRI Law Preview, which includes responses from 500 pre-law students expected to matriculate into the Class of 2021, demonstrate a similar finding. When asked to provide a primary reason for attending law school, the top two most selected options “I have always wanted to be a lawyer” and “I want to advocate for change of social policies in the United States” garnered almost identical responses at 38.2 percent and 37.6 percent, respectively. The survey also found that almost 98 percent of respondents plan to practice law after graduation, with the plurality of respondents selecting public interest (13.5 percent) as the type of law which they want to practice. The next most selected choices were business (corporate) law (12.2 percent) and criminal law (12.0 percent). Furthermore, when asked where they would like to practice law, over half of the respondents reported that they would want to practice law as an attorney working for the government (33.9 percent) or for a non-profit/non-governmental organization (22.5 percent). 39.8 percent reported wanting to work for a private firm. Lynn Page, a pre-law advisor at Northwestern University provides anecdotal evidence supporting the BARBRI survey findings when describing the students who she advises and their goals in a recent Chicago Tribune article. “If it’s not immigration (law), it’s an interest in public interest law. Most students are interested in civic engagement (and) social justice” she said. Prospective Law School Students: Do You Need a Break? Prospective law students often wonder if they should take time off between finishing their undergraduate work and applying to law school. While there is no one size fits all answer, the trend shows that many law schools are expecting and even rewarding students who take at least a brief interlude prior to starting school. Within the class of 2019, the majority of matriculants among the most competitive law schools did report a gap prior to starting law school; among the top ten ranked law schools by U.S. News and World Report, the percentages of incoming classes showed that between 60 and 80 percent of incoming students took at least one year off. Harvard and Yale were among the highest percentages at 80 and 82 percent respectively. - Management consulting/investment banking: If a future applicant has a passion for business and hope to work in corporate law, they can increase their understanding of the work by spending time at a consulting or investment banking group. - Policy analysis/research: With an interest in constitutional or immigration law, working directly in this space can provide them experience with relevant stakeholders, as well as the eventual ability to speak to their future goals more specifically within their law school application. It may also help them more strategically select law school programs that will best position them to do the work they love. - Non-profit work: If they have identified an interest in public interest law or just in gaining professional skills quickly, working for a non-profit organization could be a sound next step. Typically, nonprofits have lean workforces and, as a result, even recent college graduates are asked to work outside their comfort zone to acquire new skills. Further, it is important to note that some organizations like Teach for America have relationships and scholarship programs with select law schools. - Paralegal/legal assistant/legal administrator: For those interested in learning more about working within a law firm, this type of experience will broaden a candidate’s understanding of the day-to-day life of a lawyer and will also likely show meaningful commitment to both law schools and future legal recruiters. While it isn’t necessary to take a gap-year between undergraduate and law school, if you do, it is of vital importance to spend your time thoughtfully and productively. It may seem appealing, in those months after college, to solely focus on LSAT and application preparations. But remember, admissions committees will be looking very closely. Meaningful and productive work will help you to construct a narrative that will bolster your story as an applicant and positively contribute to the dynamic of your law school class.